Kevin Hillstrom: MineThatData: But My Campaigns Work!! More than a hundred projects help one achieve clarity. My projects make one thing really, really clear ... we don't know how to measure campaign performance. 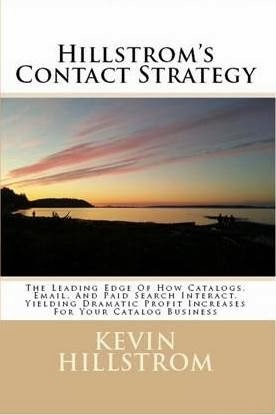 I recently analyzed the purchase trends across dozens of businesses since the year 2000. The analysis showed that customer buying habits have not fundamentally changed in fifteen years. In other words, the number of campaigns have increased so dramatically (#omnichannel) that we can barely keep track of them. Opportunities to purchase have never been greater. Discounts and promotions are everywhere, at rates nearly inconceivable fifteen years ago. And yet, customers are still buying at the same rates they purchased at in 2000. This tells us that we're measuring everything incorrectly. When you perform frequency testing, measurement errors become highly obvious. Take a look at this table. Look at what happens to the productivity of email campaigns, as we go from one mailing a week to five mailings per week - and then, when we tack discounts/promotions on top of email campaigns. First, the productivity of an individual campaign drops like a rock as you add more campaigns. In-campaign performance drops from $0.20 per customer to $0.14 to $0.11 to $0.09 to $0.08 per campaign, as you go from one to five campaigns per week. In other words, your campaigns are competing against each other ... you're not competing against the competition, you're competing against yourself!! 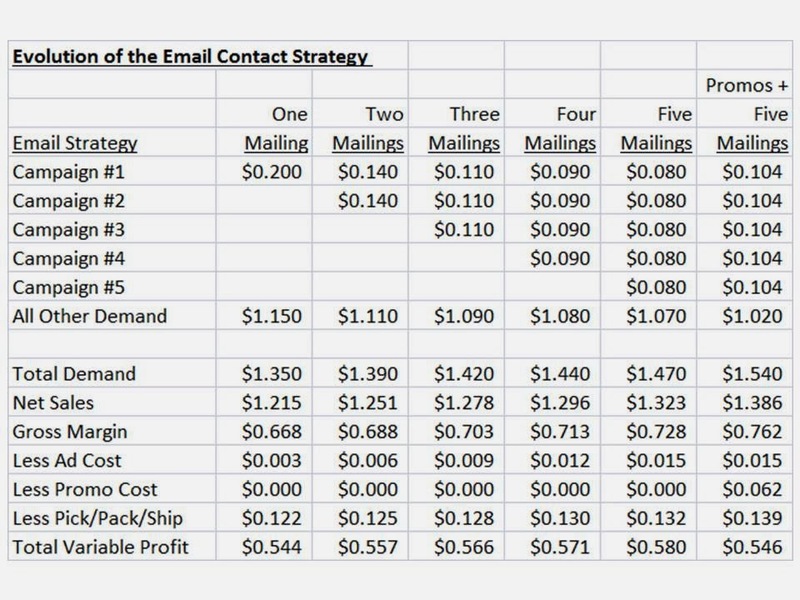 Look at the "all other demand" line ... the more email campaigns you send, the more demand you cannibalize from other sources (direct load, in most cases). So, yes, demand increases, and profit even increases ... until you get to the point where you panic and toss in 20% off plus free shipping. That's the last column in the table. Productivity goes back up, but profit falls apart. In other words, you could send one campaign a week, or you could send five a week each with 20% off plus free shipping, and get the same amount of profit. This, by the way, is a kind evaluation ... most often, the discounts and promotions happen on the website as well, driving profitability south. I know, I know, you have email reporting that tells you that everything you are doing is "right", that it "works". Please try contact frequency testing. It will show you that you're measuring your campaign effectiveness incorrectly. $29 via Print on Amazon. $10 via Kindle on Amazon.